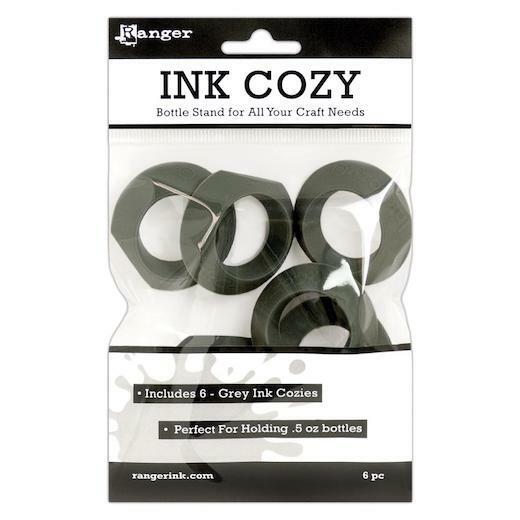 The Ranger Ink Cozy is the perfect workspace addition for any crafter. Designed to securely hold .5 oz bottles, the silicone cozy has a cone shape with a flat bottom that holds your bottles in an upright position to avoid unwanted accidental spills. The cut edge makes the cozy ideal for storing paints and mediums on their sides to establish a continuous flow to the tip of the bottle for quick use. The Ranger Ink Cozy works perfectly with Tim Holtz Alcohol Inks and Mixatives, Stickles, Liquid Pearls and more.